Astronomers have found an extraordinary galaxy cluster, one of the largest objects in the universe, that is breaking several important cosmic records. Observations of the Phoenix cluster with NASA's Chandra X-ray Observatory, the National Science Foundation's South Pole Telescope, and eight other world-class observatories may force astronomers to rethink how these colossal structures and the galaxies that inhabit them evolve. Stars are forming in the Phoenix cluster at the highest rate ever observed for the middle of a galaxy cluster. The object also is the most powerful producer of X-rays of any known cluster and among the most massive. The data also suggest the rate of hot gas cooling in the central regions of the cluster is the largest ever observed. The Phoenix cluster is located about 5.7 billion light years from Earth. It is named not only for the constellation in which it is located, but also for its remarkable properties. "While galaxies at the center of most clusters may have been dormant for billions of years, the central galaxy in this cluster seems to have come back to life with a new burst of star formation," said Michael McDonald, a Hubble Fellow at the Massachusetts Institute of Technology and the lead author of a paper appearing in the Aug. 16 issue of the journal Nature. "The mythology of the Phoenix, a bird rising from the dead, is a great way to describe this revived object." Like other galaxy clusters, Phoenix contains a vast reservoir of hot gas, which itself holds more normal matter — not dark matter — than all of the galaxies in the cluster combined. This reservoir can be detected only with X-ray telescopes such as Chandra. The prevailing wisdom once had been that this hot gas should cool over time and sink to the galaxy at the center of the cluster, forming huge numbers of stars. However, most galaxy clusters have formed very few stars during the last few billion years. Astronomers think the supermassive black hole in the central galaxy of a cluster pumps energy into the system, preventing cooling of gas from causing a burst of star formation. The famous Perseus cluster is an example of a black hole bellowing out energy and preventing the gas from cooling to form stars at a high rate. Repeated outbursts in the form of powerful jets from the black hole in the center of Perseus created giant cavities and produced sound waves with an incredibly deep B-flat note 57 octaves below middle C, which, in turn, keeps the gas hot. "We thought that these very deep sounds might be found in galaxy clusters everywhere," said co-author Ryan Foley, a Clay Fellow at the Harvard-Smithsonian Center for Astrophysics in Cambridge, Mass. "The Phoenix cluster is showing us this is not the case — or at least there are times the music essentially stops. Jets from the giant black hole at the center of a cluster are apparently not powerful enough to prevent the cluster gas from cooling." 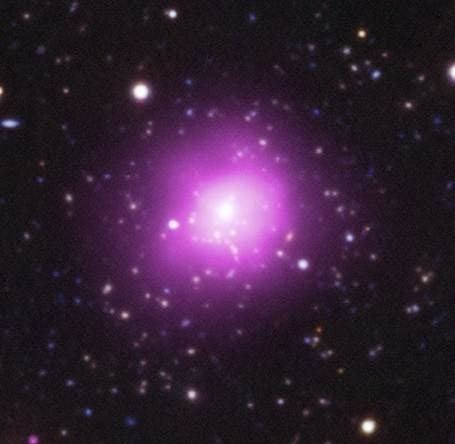 With its black hole not producing powerful enough jets, the center of the Phoenix cluster is buzzing with stars that are forming about 20 times faster than in the Perseus cluster. This rate is the highest seen in the center of a galaxy cluster but not the highest seen anywhere in the universe. However, other areas with the highest rates of star formation, located outside clusters, have rates only about twice as high. The frenetic pace of star birth and cooling of gas in the Phoenix cluster are causing the galaxy and the black hole to add mass very quickly — an important phase the researchers predict will be relatively short-lived. *"The galaxy and its black hole are undergoing unsustainable growth," said co-author Bradford Benson, of the University of Chicago. "This growth spurt can't last longer than about a hundred million years. Otherwise, the galaxy and black hole would become much bigger than their counterparts in the nearby universe." Remarkably, the Phoenix cluster and its central galaxy and supermassive black hole are already among the most massive known objects of their type. Because of their tremendous size, galaxy clusters are crucial objects for studying cosmology and galaxy evolution, so finding one with such extreme properties like the Phoenix cluster is important. 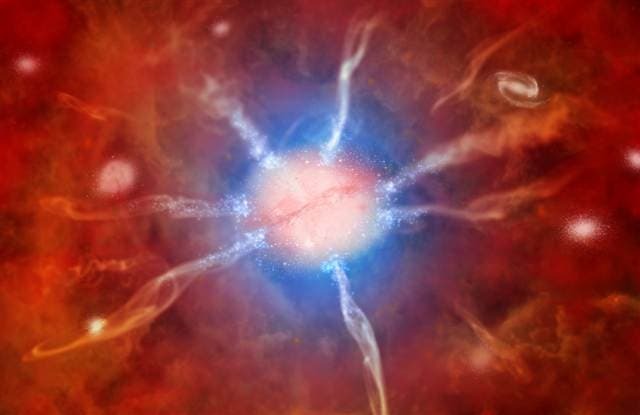 "This spectacular star burst is a very significant discovery because it suggests we have to rethink how the massive galaxies in the centers of clusters grow," said Martin Rees of Cambridge University, a world-renowned expert on cosmology who was not involved with the study. "The cooling of hot gas might be a much more important source of stars than previously thought." The Phoenix cluster originally was detected by the National Science Foundation's South Pole Telescope, and later was observed in optical light by the Gemini Observatory, the Blanco 4-meter telescope and Magellan telescope, all in Chile. The hot gas and its rate of cooling were estimated from Chandra data. To measure the star formation rate in the Phoenix cluster, several space-based telescopes were used, including NASA's Wide-field Infrared Survey Explorer and Galaxy Evolution Explorer and ESA's Herschel.